Snakes are fascinating creatures, and none are more so than cobras. Revered throughout India and Southeast Asia for millennia, cobras are the stuff of legend. The Hindu deity Lord Shiva is often depicted with a cobra necklace, while Lord Vishnu dreams the world while sleeping on the giant cobra Ananta. The Egyptian Uraeus, which appeared on headdresses, is an image of a spitting cobra meant to depict the goddess Wadjet. Loosely speaking, the tropical rainforests and jungles of the world are home to some 270 different species of cobra, but confusion exists as what a cobra actually is. While true types of cobras belong to the genus Naja, the most famous cobra of all, the king cobra, belongs to its own genus, Ophiophagus. Moreover, the shield cobra and coral cobra of Africa belong to the genus Aspidelaps. If you count only members of the genus Naja, the number of cobra species worldwide reduces to 31. So What Is a Cobra Anyway? The word cobra comes from the Portuguese phrase "cobra de capello," which means "snake with hood." This term can apply to a number of snakes that aren't true cobras but are able to form hoods, such as the king cobra and the ring-necked spitting cobra (Hemachatus haemachatus). People have called these snakes cobras for so long that the name has stuck, and today, they are as worthy of the name cobra as the members of the Naja genus, which are considered the true cobras. Cobras are venomous and belong to the family Elapidae. All members of this family have short, hollow fixed fangs in the front of their mouths that they use to inject venom. Some species have developed the ability to spit venom by forcing it through small aperture in the teeth. Cobra venom isn't the most powerful snake venom in the world, but cobras typically deliver it in large amounts and can bite repeatedly in a single lunge. A king cobra bite can result in death within minutes. 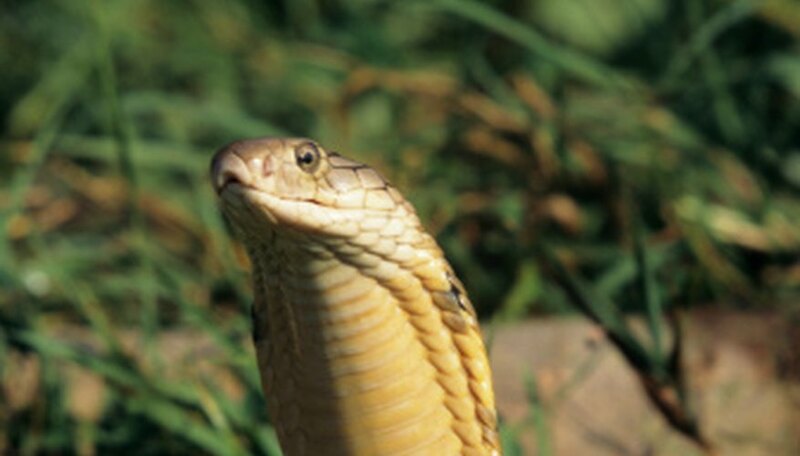 Except for the Spanish cobra (N. iberica), the European cobra (N. romani) and the Caspian cobra (N. oxiana), cobras tend to inhabit tropical regions of Africa and Asia. They can range from a few feet in length to 7 or 10 feet. The king cobra, the longest venomous snake in the world, can grow up to 18 feet, but remember, it isn't a true cobra. Cobras are often named after their preferred habitat or the country in which they are found. The forest cobra (N. melanoleuca) lives in the forests of west Africa and is one of the longest true cobras. The cape cobra (N. nivea) is a a greatly feared denizen of the Cape area of South Africa and the Indian cobra (N. naja) is the leading cause of death by snakebite in the Indian subcontinent. Other common cobras with regional names include the Chinese cobra (N. atra), the Philippine cobra (N. philippinensis) and the Egyptian cobra (N. haje). Some types of cobra snake are named after their appearance or behavior. Examples include the monocled cobra (N. kaothia), which displays a monocle-like circle on its hood, the zebra spitting cobra (N. nigricincta), which has zebra-like stripes and the burrowing cobra (N. multifasciata), which burrows. About ten species of true cobras are spitting cobras. These snakes use this venom delivery method as a defense mechanism, usually to buy time so they can make good their escape. They aim for the eyes are accurate at distances up to 10 feet. The venom is painful, and if not treated immediately, can cause blindness. Examples of spitting cobras include Ashe's spitting cobra (N. ashia), also known as the giant spitting cobra, which lives in Africa, and Burma's Mandalay spitting cobra (N. mandalayensis). The Mozambique spitting cobra (N. mossambica), which predictably lives in Mozambique, is one of the smallest cobras, reaching a length of only around 3 feet. World Atlas: How Many Types Of Cobras Are There? Which Species Are Most Venomous? Deziel, Chris. "Types of Cobras." Sciencing, https://sciencing.com/types-cobras-8375726.html. 08 August 2018.